The Mani Mahesh Kailash Trek revolves around the famous Mani mahesh Lake also known as Dal Lake, situated close to the Mani Mahesh Kailash Peak in the Pir Panjal Range of the Himalayas at an elevation of 4,080 meters. The lake is situated in the Bharmour subdivision of Chamba district of Himachal Pradesh and the location has a religious significance since it is placed next to that of the Mansarovar Lake in Tibet. The lake is also known as Chamba Kailash and is famous for Manimahesh Yatra (pilgrimage). The pilgrimage starts in Bharmour that has beautiful ancient temples all around the region. The region attracts people for this famous pilgrimage trek that commends during the month of August and September corresponding to the month of Bhado according to Hindu calendar. A popular legendary tale explains that Lord Shiva created Mani Mahesh after he married Goddess Parvati and also performed penance on the banks of Mani Mahesh Lake. The most popular adopted route of the Mani Mahesh Kailash Trek is the Bhanrlour-Hadsar-Manimahesh route that includes a 13 kilometers track from Hadsar village to the Manimahesh Lake. Pilgrims also start trekking from Lahaul and Spiti pass through Kugti pass. Those coming from Kangra and Mandi take the Karwarsi pass or Jalsu pass via Tyari village, near Holi in Bharmour. 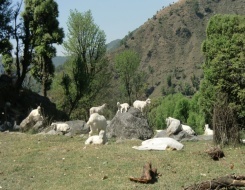 However, the route from Chamba via Bharmour is the easiest one. In the evening drive to Dharamshala by AC Volvo Coach. Overnight journey. Arrival at Dharamshala by early in the morning and transfer to hotel for relax & acclimatisation. Dinner and overnight stay in hotel. In the morning drive up to Hardsar and then further trek to Dancho. From Hardsar, we gradually ascend to Dancho. It will take around three hrs to walk these 7 kms. Dinner & overnight stay in tent. In the morning after breakfast trek to Manimahesh lake. Today we will climb from Dancho to Manimahesh Lake. This is long and gradual climb. Dinner and overnight stay in camp. After exploring the area we will trek back to Dancho. Today we will trek downwards. Dinner and overnight stay in camp. In the morning after breakfast trek back to Hardsar and from here drive to Dharamshala. On arrival check in to hotel. Dinner and overnight stay in hotel. Overnight in Dharamshala. After breakfast half day sight seeing tour of Dharamshala & in the evening drive to Delhi by AC Volvo coach. Overnight journey.